I had so much fun participating in Mie's Sewing for Kindergarten series for my oldest daughter that I practically begged Mie to let me join again for Tandy. She graciously made a spot for me!! Mie provided a few questions to answer, so I will sprinkle them throughout the post. First, Is this your first time sending a child to Kindergarten? If not, which number child is this? Tandy is my second and last child to enter Kindergarten. Reading my first Sewing for Kindergarten post sent back a flood of memories!! Tandy should technically still be in pre-K since she is four until the end of October. Her school has allowed her to advance to Kindergarten with the premise that she will likely repeat Kinder again. She is thriving and school ends at noon for her, so the schedule suits us both just fine. What kind of school does your child attend? 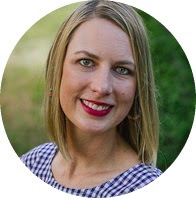 (Public, charter, private or homeschool) Tandy attends a Classical Christian private school. The school adheres to a pretty stringent uniform policy down to the tote bag. The flexibility this year is with P.E. days (bottoms only) that are twice a week, and the occasional denim day. I decided to capitalize on that bit of wiggle room for two looks. Since Tandy's school day ends at noon, she will use the tops for the remainder of her day. I sewed the PE bottoms using the mini Hudson pants pattern. The cropped slim fit of the leg is stylish and cool enough as the weather transitions. The fabric is Telio Ponte Leggero from fabric.com. I love the weight and feel of this stuff! Now I just need some for Hudson pants for me! The top is by German designer Elle Puls called Bethioua Kids. Be watching for an English version releasing with Naeh-Connection soon!!! The sleeves are velour and the body is french terry. Another Question from Mie: Do you feel like crying or celebrating? And what about your child? We were both excited. My husband teased me about being a little too excited. We had a wonderful summer, but public schools around here started two weeks before we did. That meant that our pool closed down, and things just got down right quiet. We were all ready to get back to a routine and see friends again. Maybe it's this way with each year, but I feel like Kinder and 3rd, for my oldest, are big years. I'm so excited to watch and help Tandy learn to read! Avery has just reached the point where we have to go to the library once a week to keep enough books around. These are big milestones to me! I simply could not join a blog tour hosted by Mie, the queen of Sew Japan, without including some Japanese sewing patterns! These are patterns N and O from Happy Homemade: Sew Chic Kids. Check out my book review here. This sweet top features raglan sleeves, a button placket and gathers at the neckline and just below the placket. If you plan to sew this top, I do have a couple of suggestions. The instructions leave installing the buttonholes until the very end. I recommend sewing the buttonholes just after you stitch the plackets in place and before you overlap them. This will give you more room to maneuver everything around your machine. I would also recommend securing the gathers with a zigzag stitch before covering them with the lace, or in my case, bias tape. The raw edges are exposed on the inside, so this will help reduce any tendency to unravel. The body of the top is Honor Roll fabric by Anna Maria Horner, and the sleeve fabric is Michael Miller Cotton Couture. I have used both fabrics before for big sis. Tandy still struggles with a zip and button fly, so elastic waist pants are perfect for her and less trouble for her teachers. We have plenty of skinny jeans, so these wide leg pants are a fun alternative. The fabric is a super soft lightweight tencel denim. I did the topstitching in jeans thread for a traditional look. I cut these extra long just to be on the cautious side. I ended up doing a 1.5" hem, and I love the look for the wide leg pants! The last question from Mie is for my kindergartner: What has been the best and the worst part so far? Best: Swinging on the playground, being a line leader, and going to the treasure box. A bit predicable I must say! 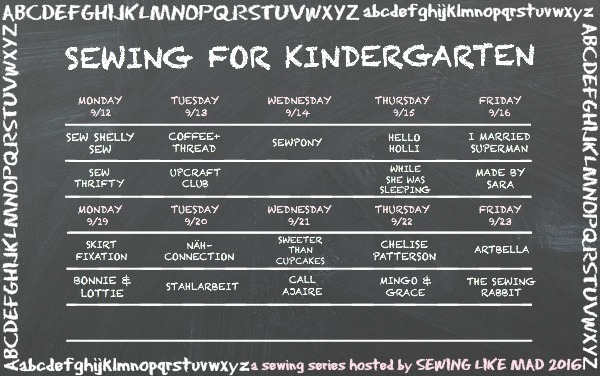 Be sure to check out the rest of the Sewing for Kindergarten tour!! Courtney this is fantastic! I love it SO much. And btw I was more than happy to find a spot for you - I especially love when siblings come back to this series. The velour sleeves are killing me and those navy Hudsons are just way too cool. And the Japanese outfit - gorgeous! I want those jeans! And like I wrote in my intro, that Anna Maria Horner flower print is still some of my favorite print ever. This was so fun! Thanks again Mie! I really want some navy Hudson pants now too! Love what you made for your Tandy! That Japanese top is so darling. Lately you've been sewing up a storm. Oh, and I may or may not have begged Mie for a spot too...her series is just that fun! We just can't help ourselves! So glad Mie gets it! I loved your collection too! I love both outfits so much! Your Hudsons are reminding me that I still need to make this pattern. That fabric looks terrific. I love the Japanese outfit, too! It's beautiful. Thank you! It is always fun to pull out my Japanese books. I seem to use them in spurts. I have another Bethouia in the works! It is a very fast and fun sew! There are lot of Portable sewing Machine which you can buy.